Pannaiyaarum Padminiyum is a story that shows the emotional connection landlord has on a Premier Padmini car. The team of Pannaiyarum Padminiyum has decided to promote the movie using 90's style techniques, to suit the nativity of the film. Pannaiyarum Padminiyum has an ensemble cast of Vijay Sethupathi, Jayaprakash and Ishwarya Rajesh. Cinematography is handled by Gokul Benoy and editing by Sreekar Prasad. The movie is produced by M.R. Ganesh under the banner of Magicbox Films. 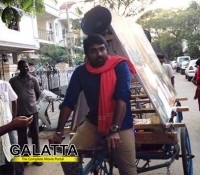 >>Vijay Sethupathi's next titled Sethupathi? >>Nani acquires remake rights of Pannaiyarum Padminiyum!